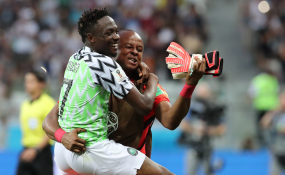 Gernot Rohr has dismissed suggestions that the Super Eagles are lacking a natural number 10 in the center of the pitch ahead of the 2019 Africa Cup of Nations with the international future of Obi Mikel up in the air. "I am not worried about it because we have a lot of players who can be natural playmakers," Rohr told TV Continental. "You know we have players like Etebo who can be a playmaker, he can also be a good defensive midfielder. "We have Alex Iwobi who played in this position and did very well in Johannesburg, we have Ahmed Musa who is coming in from the left side and can give good balls and score himself." "Everybody must be able to make the play, to be a playmaker even the defensive midfielders or even the defenders have to give good balls and to construct the game."